Minecraft. Can you guess what the game is about? If you guessed “mining" and “crafting" – congratulations! Both of these elements are important, and they’re related. You have to mine resources in order to craft items, and the items you craft often help you mine better resources so you can craft even better items. In this article we’re going to focus on how to craft tools, weapons and armor in Minecraft. There is a heck of a lot of stuff to craft, and it can take some time to learn everything, but practice makes perfect. If you need to learn more about how to survive your first night in Minecraft, check out our tutorial. These crafting recipes produce some basic resources and tools that you must have to explore the world, make complex items and store your loot. Wood: Place on log into your craft panel. Four pieces of wood can be produced for each log. Sticks: Place two pieces of wood in a vertical line in the crafting panel. This will create four sticks. Torches: Place on piece of coal on top of one stick in the crafting panel. This will create four torches. Torches are required to light up dark areas. Workbench: Put four pieces of wood in a box shape in the crafting panel. This will create one workbench. The workbench is essential because it lets you access a 3×3 crafting panel rather than the 2×2 panel in your normal inventory. Furnace: Put eight cobblestone blocks in a large box shape in the 3×3 crafting panel. The only space not occupied by a cobblestone should be the middle space of the crafting panel. 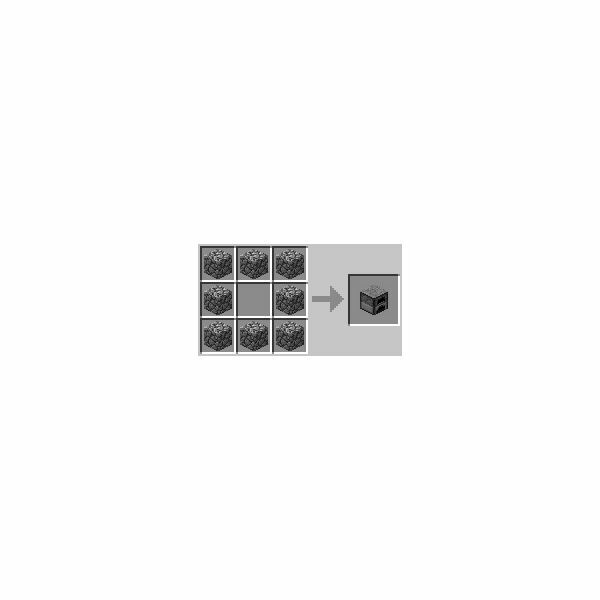 Furnaces are required to transform raw ores into usable materials. Chest: Put eight wood in a large box shape in the 3×3 crafting panel. The only space not occupied by wood should be the middle space of the crafting panel. Chests are required to store items once your inventory is full. Armor is used to protect you from the attacks of the many nasty creatures roaming the world and living in caves. You can see your armor protection in the lower right hand corner. Armor can be constructed from Leather, Iron, Gold or Diamond. Helmet: A new helmet provides 1.5 points of armor. It is crafted by placing three blocks of material horizontally in the middle row of the 3×3 crafting panel and then pacing two blocks on the left and right of the bottom row, leaving the middle space open. Chestplate: A new chestplate gives 4 armor points. It is constructed by filling up the entire 3×3 crafting window with materials except for the middle space in the upper row. Leggings: A new set of leggings will provide 3 armor points. It is constructed by placing seven materials in an upside-down U pattern in the 3×3 crafting panel. These are used to kill monsters. There two weapons in the game, and one form of ammo. 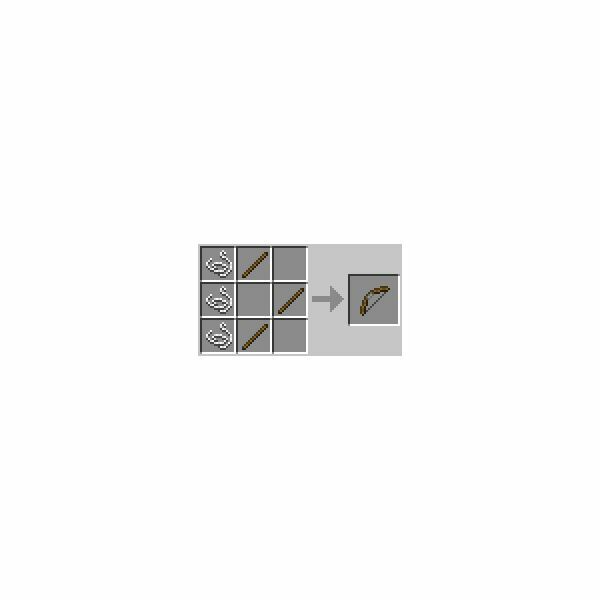 Sword: The only melee weapon available, a sword is made by placing one stick at the bottom of a 3×3 crafting window and then placing two materials vertically on top of it. Swords can be made out of wood, cobblestone, iron, gold or diamond. Bow: The only ranged weapon, a bow is made by placing three strings vertically on the left side of a 3×3 crafting window, placing two sticks in the middle column with a space in the middle, and placing one final stick in the middle of the right column. Arrows: To fire a bow, you need arrows. Arrows are constructed by arranging three different materials vertically in a 3×3 crafting panel. At the top you need flint, in the middle you need a stick, and at the bottom you need a feather. Crafting tools is a very important part of Minecraft. Tools accelerate the speed at which you mine materials, and some more exotic materials (like Diamond) can only be mined with the proper tools. Axes, Pickaxes, Shovels and Hoes can be built out of various materials, so substitute the material of your choice into the formula. 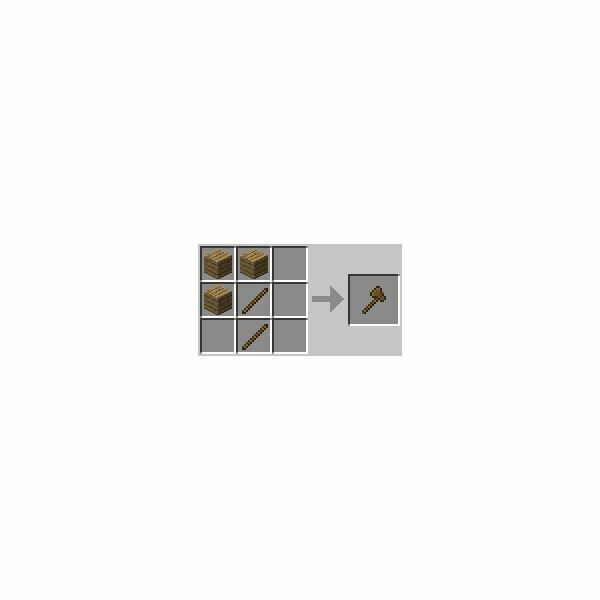 Axe: Place two sticks on top of each other vertically in the middle of a 3×3 crafting window, then arrange three materials (wood, cobblestone, iron, etc) in an upside-down L shape in the upper left of the crafting window. Axes help you harvest wood more quickly. Pickaxe: A critical tool, the pickaxe is created by placing two sticks vertically and then placing three materials horizontally along the top of the 3×3 crafting window. The sticks and materials together should form a T shape. Pickaxes help you harvest stone and ore.
Shovels: Place two sticks vertically and then place one material at the top of the two sticks. Shovels help you clear soft materials like dirt, grass and snow. Hoes: Place two sticks vertically and then place two materials horizontally. One material should be directly on top of the sticks and the other should be one block to the left. Hoes are created to till the ground so that you can find and plant seeds. Flint and Steel: Place on piece of flint into the crafting panel, then place an iron ingot on space up and to the left. This tool is used to create fire, which can of course be used to burn down flammable objects. Bucket: Place three iron ingots into the craft panel in a V shape. The bucket is used to transport water, lava and milk. Compass: Place one Redstone Dust into the middle of the 3×3 crafting panel and then place four iron ingots around it to the left, right, top and bottom. The compass is used to find your spawn point. Watch: Place one Redstone Dust into the middle of the 3×3 crafting window and then place four gold ingots around it to the left, right, top and bottom. The watch tells you the time of day, which is useful when you are deep underground. Fishing Rod: Place three sticks into the 3×3 crafting panel diagonally so that the stick furthest to the left is on the bottom and the stick furthest to the right is on the top. Then place two pieces of sting vertically below the stick on the right. As you’d expect, the Fishing Rod is used to catch fish.